Hey there! Thanks for dropping by Respite Retreat's Blog! Take a look around and grab the RSS feed to stay updated. See you around! Nancy Thomas bonding camp opportunity in TN this year!!! New bonding camp opportunity in our neck of the woods! October of 2013 — Nancy Thomas will be conducting a week-long camp in Hixson, TN. Contact Jennie Landreth for more information — 423-667-6942. I’ve been a camp counselor and can answer questions from my own experience and insight, too. This is an experience I believe every adoptive (or natural-born) family will benefit from. Although somewhat pricey, the value exceeds the cost exponentially … and you have seven months to save and do fundraisers. Respite Retreat is not official sponsoring this camp but it is a project we will gladly support ad advocate for. As a non-profit ministry, we will gladly accept donations from friends, family, and church members on your family’s behalf (we will provide tax receipts), and apply those funds to camp in your name. Hope to see you there!!! We regard high nutrition to be among one of the best “treatments” to helping troubled children heal. That and a sound balance between nurture and structure … and severely-restricted electronic over-stimulation. But I’ve battled a middle bulge for several years, too. I had heard rave reviews about the book “Wheat Belly” by William Davis. I read a bit here and there on genetically-engineered wheat (said to be worse than genetically-modified). And I decided to conduct my own “scientific” experiment: using Einkorn as the ONLY source of wheat in our diets for thirty days. Since we work hard to incorporate the best nutritional resources into our ministry, what we discover here will, I already suspect, be widely incorporated into our nutrition program and recommended to the parents and professionals we work with. We already grind our own flour and make our own breads and pastas, so this experiment fits in nicely with our current lifestyle. For others who don’t have as much time or interest in that much effort, there are some ready-made pasta and bread products available on the market. To begin with, I ordered 25# of Einkorn wheat berries from Jovial (www.jovialfoods.com). I scoured the Internet for a variety of recipes, some of which I will try and post reviews of here — but my readers are certainly intelligent enough to find the recipes that suit their own individual tastes.. To get started, I ground enough flour to make three small loaves of bread, a batch of pita bread (made 27 six-inch pitas), 1.5 pounds of pasta (two meals for our family), two pie crusts for quiche, and the beginnings of a sourdough starter — nine pounds of berries. The pita bread recipe came from a source that was specific to Einkorn recipes; we simply substituted fresh ground Einkorn flour for wheat in my regular pasta dough and pie crust recipes. The pie crust seemed very wet and indeed it was too wet to roll out, but I just shaped it into the bottom of my pie pans by hand. I coated the pasta dough with a bit of olive oil and wrapped it tightly, then refrigerated it overnight, allowing it to rest at room temperature for about 20 minutes before rolling and cutting it. As the photos depict, both turned out absolutely perfect. The pie crust has a nice flavor to it and wonderful flakiness (shown in the photos somewhat). It’s too early to tell yet whether I am going to feel better eating Einkorn than regular wheat or whether the higher cost will be worth it in the long run. I noticed two things, however. The first is that my stainless steel bowls and coated mixer blades washed clean with very little effort after soaking just a few minutes in hot water. In other words, the residual dough dissolved, whereas regular wheat dough sticks much monger and requires more effort to clean. That was interesting. The second is that I could not eat the entire pita at breakfast … something I generally do not have a problem doing. That, too, is interesting because it means that my appetite will be sated before I eat all the calories from the serving sizes I have been accustomed to. I wanted to really journal this journey fully because a LOT of folks contact me privately about nutritional issues with their RAD child(ren). But alas my bathroom scale was broken when I tried to get a baseline weight. It said I was 70 pounds … and much as I’d love to believe that, I ordered a new scale from Amazon and will note any weight variations over the coming 30 days. My goal is not necessarily to lose weight (I am 5’6″ and weigh roughly 150 pounds) — although I would be delighted to lose that extra 15 pounds I’ve been carrying for the past decade — but it IS to determine whether I have better health, mental focus and clarity, less irritability (bodily and mood-wise), etc … as well as to see if I can nudge off that elusive thick middle. My three youngest children, ages 6, 8 and 10, will be completing this 30-day challenge in its entirely; so hopefully I will find a nice balance in regulating my appetite while not interfering with theirs. Otherwise, this experiment will be a bust in terms of incorporating it into our nutritional program here. This is my blog so I’m going to vent here. Yes, we do provide respite care … but we ONLY provide such care for families we are working with extensively to help the parents transform their parenting approach so that their child feels safe and can make secure attachment. In the interim, we work intensively with the child to help them learn respect for authority, how to regulate their emotions better, and accept the same parenting tools and techniques that his or her parents are learning and will employ in their own home. Earlier this month, I received sixteen calls in one week seeking respite care. Most of these families just want someone to take their “sick” child in and heal him. They don’t want to look in the mirror and see what part of the equation THEY have in helping their child heal. There are plenty of other respite facilities that will take in any child whose parents are paying their fee. We are not interested in that at all. This is a ministry and our focus is on helping the family to heal from the inside-out and that necessarily involves the parents working hard, too. That being said, we put our money where our mouth is in hiring experts to conduct training seminars for the families in our surrounding communities. We have one of the nation’s best respite provider — recommended by Nancy Thomas herself — scheduled to do a respite training on 09/15/2012. I invited each of those 16 moms to the seminar, imploring them to bring a friend/neighbor/family member to be trained so that they can build up their own team. Every one of them had an excuse. We are just two people — and there are very few truly-qualified, worthwhile professional respite provides. Most of those charge a lot of money for their services; and few families can afford them. We want to equip families to HELP THEMSELVES … but we cannot do it when so many families refuse to do so. Any mom of a RAD child should be able to see the value of having someone close to them trained in respite care as a critical part of their team, ready and willing to step in to help during times of crises or when the mom just needs a break. It is deplorable that so many families are sitting back and waiting for others to step up and do all the work. We have been doing respite or therapeutic foster care for catastrophically-effected children for more than a decade and *I* cannot wait to learn what wisdom Susan has to teach at the 09/15/2012 seminar! She is a speaker, author, respite provider, counselor-candidate, and adoptive mom of a now-healed and thriving RAD child. We can only help families who accept the offer and DO THEIR PART. That includes building their own support team … and having a trained respite provider is one of the most critical members of that team. We invite each of you to come and bring someone to be trained. Learn more about respite care, what it is, what it is not, and how it should be done! Please see http://respitetraining-eorg.eventbrite.com/ for all details. Scroll down for special rebate for parents who bring their own friend or family member to be trained as a respite provider! Erin delivered two lovely little doelings (girls) tonight at 9:40 and 9:46 p.m. One of them even has a heart-shape on her left side. Well, almost. 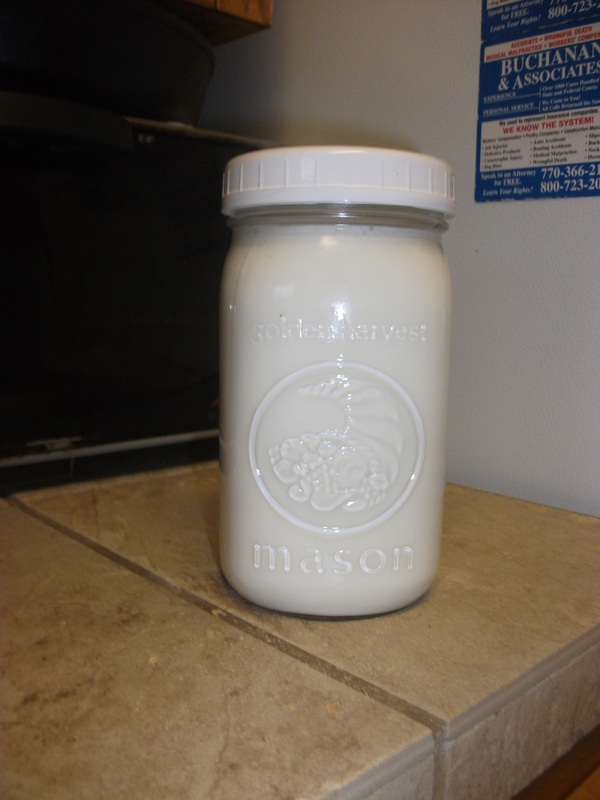 Erin milked out a full quart of colostrum. One more yet to kid. Just 26 hours after delivering her boys, my favorite doe, Savannah, STILL gave us an extra quart of milk — and her boys are drinking machines. They were up last night to eat at 12:30, 1:30, and 4:00. When they cried for more at 7:00, I brought them out to the barn (rather than milking Savannah and bottle-feeding Cosmo and Galaxy) and left them with her. She was delighted. It takes a special doe to “share” her kids with us. We bottle-feed because it imprints the kids onto humans and results in a calmer, gentler creature who is very comfortable around people and learns good boundaries and manners. Some of my most favorite things are fresh, raw milk, children who delight in God’s creation, well-bonded does who allow me to help care for their kids, sweet bahs of newborn kids (yes, even at 1:30 and 4:00 a.m.!) … and spotted goats. I can see the spots emerging; I cannot wait to see what they look like next week! Cosmo taking a nap (with the white splash). And Galaxy is already bonded to my daughters. The photos show the progression … he laid down next to 8-year old Anneliese, stood up when his momma came around to sniff him, nuzzled Anneliese when his momma started to nudge him, and climbed in Anneliese’s lap when his momma started to lick him. (The last photo shows Anneliese’s delight!) Savannah, is my favorite doe and she is a fabulous momma. 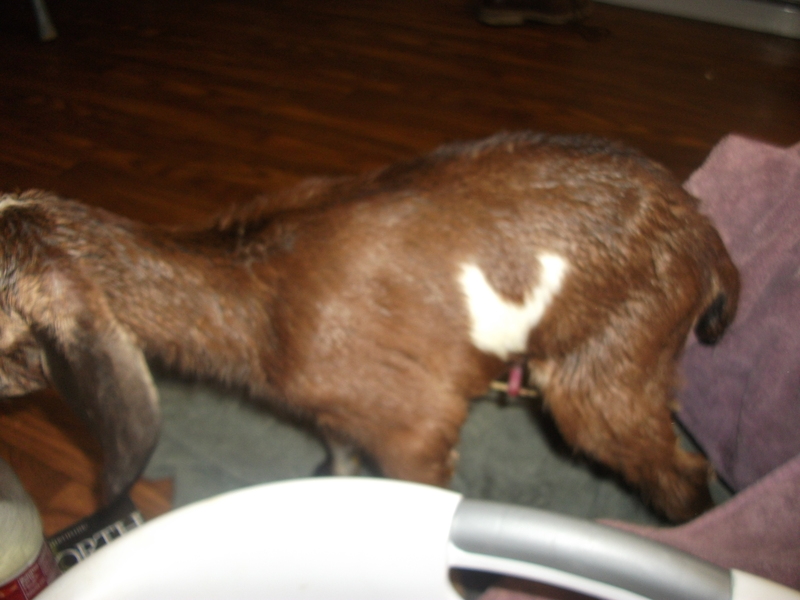 But it is also important that our goat kids imprint on people, too, so that they learn to be calm and mannerly around even young children. Our bucks grow up to weigh as much as 350 pounds and an ill-tempered, ill-mannered one is especially dangerous! INTENSIVE program (*very limited*), seminar, master’s program … oh my! The upcoming week-long “Intensive” programs are scheduled for 03/03/12-03/10/12 and 03/12/12-03/19/12. These programs are limited to only three families each week, each of whom will receive upwards of 3-4 hours of one-on-one, individualized counseling every day for a solid week! This year, we are blessed to have two separate attachment therapists (one for each week): James Dumesnil and Deborah Hage. Both are highly respected in the attachment field. We have worked with James over the past year and regard him as an invaluable resource for the families we serve; he has been extremely effective! Deborah is a welcome addition and we are grateful for the opportunity to expand our network. Registration for the Nancy Thomas seminar is open and filling up. We’ve got a slew of special education teachers coming from all across the State of Georgia, to my delight. This year, we reduced the parent/support person registrations by 8-20% from last year. In addition, a kind benefactor has offered to donate funds to reduce teacher and professional registrations by 10%. We have received fewer parents are registered thus far; and more professionals from out of state. Although the title of the seminar suggests that the focus is solely on children with attachment issues, it really is powerful presentation that will apply to most of the adults in attendance, in one way or another. In fact, many parents exacerbate their children’s behaviors (“healthy” or not) by their own parenting strategies … and some of those are rooted in underlying attachment issues and influenced by the parents’ own traumatic stress experiences. The master’s program in professional counseling has begun! My first textbook is one written by Tim Clinton, President of the American Association of Christian Counselors (AACC). It is the first textbook I have really enjoyed reading and it aligns with all of my personal beliefs on the subject of soul-care from a Christian perspective. Yesterday, on my second day of classes, I joined AACC as a student. We are currently looking for a therapist who is trained and skilled in EMDR within 120 mile radius of our facility at the GA/TN/NC border (ranges to Atlanta GA, Chattanooga TN, Asheville NC). If you are or can recommend one, please contact us! Well, if you’re here on my blog, then you’re likely in crisis mode and about at the end of your wits. I understand! You could say I’ve “been there, done that”. My husband and I have five children: ages 5, 7, 8, 18 and 20. When our older son, now age 18, was two years old he was diagnosed severely autistic. So severe that his doctors recommended we institutionalize him because he would “never function in society”. We have since served many years as Therapeutic Foster Parents to extremely emotionally-disturbed children, particularly those suffering from Reactive Attachment Disorder (RAD). The “experts” wrote most of those children off as “unreachable”, too. Those doctors and “experts” were all WRONG … and today our son is an extraordinary young man and many of those foster children have made great strides toward healing. If you’re putting your trust in the knowledge/skills/abilities/expertise of a mere human, then you’re on a path of never-ending despair and frustration. Jesus Christ is Lord of all and He can heal these children, as He did our son! God gave us the strength to parent our son and taught us some parenting skills and structure that He later used to heal our son. Years later, those same skills and structure helped us to minister to severely-disturbed children: those who had shot others in the face with no remorse, set fires, or were sexual predators. Obviously we in the RAD-community have got to do a better job of preparing and equipping the children’s FAMILY’s with the same tools and training that WE have. What good is it if we know all the tricks and the children respond well here, only to go back to the same home environment that did not work previously? We’ve spent hours and hours and hours working with these children on respite and in foster care only to watch them dissolve when they return home. There are some fantastic programs across the nation and I encourage you to research all of them. I am partial to Nancy Thomas because she has made such a positive impact on me and the children we’ve ministered to over the years, but there are other great options like Dr. Karyn Purvis. For our part, my husband and I are working on plans to use this 50-acre guest farm for some Respite Retreats, mini bonding "camps", week-long "intensives" with Nancy Thomas and other attachment experts, training respite providers, and building an equine therapy program. The farm has three lovely log cabins, each sleeps six comfortably. The main crops are peace and tranquility.